Dr Manmohan Singh should not have attended the summit meeting of the Shanghai Co-operation Organisation (SCO) at Yekaterinberg not only because India is formally only an ‘observer’ at that outfit, but also because it is not a club that India ought to join. The co-location of the summit with that of Brazil-Russia-India-China (BRIC) was unfortunate, but even so, there was nothing to stop the Indian prime minister from attending the BRIC event, and insulate himself from the SCO pow-wows. Dr Singh, it turns out, does not have the appetite for such sharp diplomacy. But recent events suggest that there might be a little more spark in the second UPA government than there was in the first one. First, some tough-minded diplomacy—including a threat to review India’s relationship with the Asian Development Bank—succeeded in isolating China’s attempt to use a multilateral economic forum as an instrument its bilateral political dispute with India. Like at last October’s Nuclear Suppliers Group (NSG) meeting, not only were Chinese moves foiled, but China was completely isolated. Now this is in part due to China’s attempts to overplay its hand, but diplomatic victories are seldom the result of serendipity. There was hard work involved. Second, Dr Singh’s meeting with Asif Ali Zardari showed a welcome change of style. “I am very happy to meet you,” Dr Singh told Mr Zardari “But I must tell you quite frankly that I have come with the limited mandate of discussing how Pakistan can deliver on its assurances that its territory would not be used for terrorist attacks on India.” In front of the assembled media. Of course, the Indian media reported it, the Pakistani media seems to have ignored it and the Pakistani foreign minister tried to paper it over, but it still is infinitely better than two smiling faces shaking hands as if nothing had happened in Mumbai last November. Beyond style, the substance of the talks appears to be that India is willing to re-engage Pakistan in a dialogue, on condition that between now and July 16th, Messrs Zardari & Co need to deliver a meaningful something on the issue of cross-border terrorism. Third, the Indian government denied visas to members of a US government outfit that wanted to visit India to audit religious freedom, especially “concerned about judicial processes with regards to the incidents in Gujarat and Orissa are not functioning properly and we only wanted to get them going.” (It’s funny how these groups are terribly selective about improperly functioning judicial processes: for instance, the Kashmiri Pandits marooned in various Indian cities don’t even have a judicial process.) Denying them visas is a gentle way of saying “no, thank you” to these kind American people. 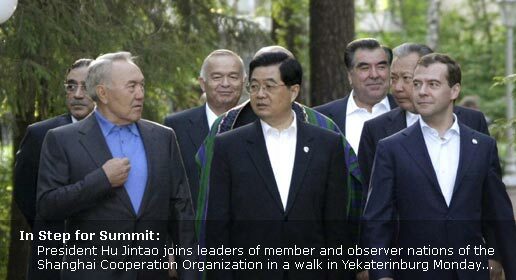 And finally, even in Yekaterinberg, it appears that the diplomatic minders did what they could to distance the Indian prime minister (see the missing) from the SCO publicity material. If all this appears to be a nice start in managing the form of foreign affairs, it is because the bar was set so low in the last five years. The next five will be rougher and more challenging. So let’s hope it is a new spring. Update: Now some Pakistani grandee declares that Dr Singh’s remarks are ‘unacceptable’, which is as weird as it is absurd. That is the Indian prime minister’s mandate, and there’s nothing in it for Pakistan to accept or reject. Also, it turns out that top Indian officials repeatedly emphasised to the media that the foreign secretaries will only discuss the investigations into 26/11, nothing more. Author Nitin PaiPosted on 17th June 2009 17th June 2009 Categories Foreign AffairsTags ADB, BRIC, China, foreign policy, geoeconomics, India, international relations, Pakistan, Russia, SCO, United States15 Comments on A new spring?